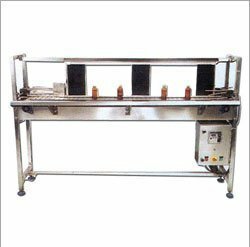 Our product range includes a wide range of bottle inspection machine. Capitalizing on the proficiency of our professionals, we are manufacturing and supplying the wide gamut of Bottle Inspection Machines. Highly durable, our machines are precisely developed in compliance with the predefined standards of quality. Can sustain in adverse working conditions, these equipments are extensively use in the packaging of cosmetic and pharmaceutical products. Our Bottle Inspection Machine shows a right mix of speed, performance, control direction and accuracy, with its advanced components, sturdy construction and sophisticated technology. It offers maximum reliability of inspection along with performance and safety. By considering our customers demands, we customize these machines in terms of heights, sizes and width parameters. Due to continuous product improvement process, design as well as specification may be upgraded / modified without notice.